Ok, I admit it, I know first-hand that there are some basic, seemingly obvious pattern writing mistakes many crochet designers make when they first start out. And, I’m guessing you’re here because you don’t want to be one of ‘those’ designers. I’m glad you’re here! I hear from would-be designers every day who are stuck in analysis paralysis – just not knowing where to start. Or they’re simply afraid to start. Is that where you find yourself today, too? Well, I’m going to share with you some very basic tweaks you can make to your first pattern design so you can side-step those pattern writing pitfalls and get to publishing your first design. Not only that, but I have a free printable “Crochet Design Sketch-Notes” for you in my resource library that will make the job so much simpler! 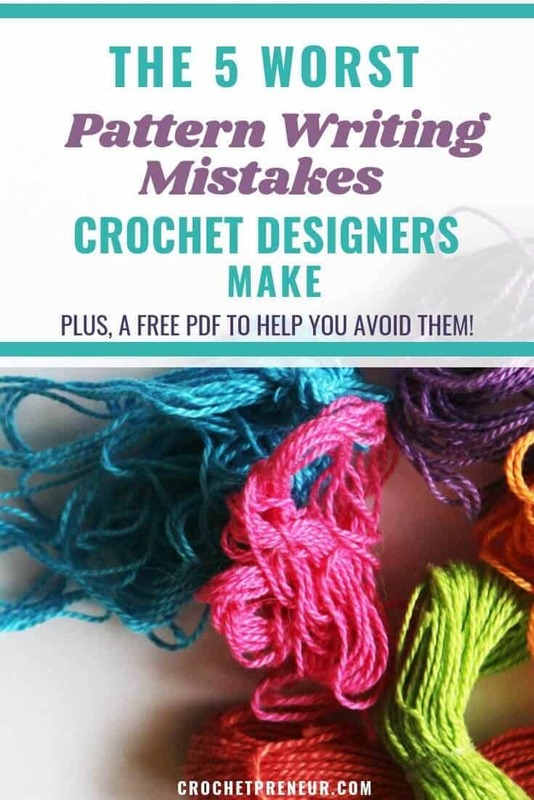 Together, going to get you on the right track, break the stalemate, and get that pattern down on paper by taking a look at common crochet pattern writing mistakes and how you can avoid them. The other camp is experienced crocheters who have been around the block for a little bit…they’re in several Facebook groups and they’ve seen the drama. Oh, you know the drama of which I speak! They’ve seen it and they don’t want any part of it…so they’re stuck in fear. The don’t want the social media trolls to come after them for some arbitrary thing that they may or may not have done wrong. They’re afraid that their first pattern might be mistakenly similar to someone else’s out there (in the big wide world) and don’t want to be accused of copying. (The issue of copying is a whole separate blog post in and of itself, but let’s leave it at this…do the right thing…you know what the right thing is). They recognize that they’re not super detail oriented and are afraid to miss a detail here or there and then be black-balled as a designer with poorly written patterns. They’re simply afraid to try something new and not be proficient at it. I could go on and on. Well, I’m telling you that those things will hold you back forever if you don’t just take the leap….yes, I’m telling you to jump into the deep end because (a) you already know how to swim and (b) there’s a whole community waiting to play with your designs (and we’ll rescue you if feel like you’re sinking). OK, are we on the same page with all that? No more hiding your designs from the world. Ugh, I’m so guilty of this one, but I’ve learned the hard way….take notes! I know, I get it. You didn’t think you were going to actually write this pattern so you just make your beautiful thing without taking notes and now you’re trying to reverse engineer the thing. It’s tough, right? So, first, my advice is to always take notes…sketch your concepts, write out the design line by line (USE PENCIL), and chart your stitches if that’s your thing. Wise designers have sketchbooks everywhere. Get yourself a one or two…or 15, whatever. But, if you’ve already got your patternless design and are wanting to get the pattern written up, my best advice is to recreate it. I know it would be tempting to simply count the stitches and write the pattern, but there is such a high probability of missing small details that taking the time to actually sit down with yarn and hook and write the pattern while recreating your design is the best way to go. Including only the US hook size and forgetting to list the size in mm. Leaving out details on the yarn and colorway used. Forgetting to provide gauge details. Not measuring the finished product. Including size adjustments by increasing hook size instead of calculating for size adjustments. Not using standardized abbreviations and sentence structure. Neglecting to include finishing details. And many more, take this link for a list of designer pitfalls as described by the Craft Yarn Council. Oh my gosh, you see? There are so many details to miss. Really, it’s all these little details that prompted me to design an editable pattern template just for you. The template includes a cover page, a legend (with fill in the blanks for all these pesky details), a photo tutorial page for special stitches, two pattern pages, three more in-pattern photo tutorial pages, an “About” page with copyright details, and a call to action (so maybe you can get some of these new customers to sign up for your email list). The template is hosted in Canva so you’ll always have access to it and it’s available to both PC and Mac users. Don’t know how to use Canva? No worries, first of all, it’s free…and the template includes a video tutorial by yours truly. I honestly think it’s going to be a super helpful tool to get you off on the right foot with your designing. If you’re interested, you can find it in my Made with a Twist Shop. Otherwise, just keep an eye out for all those little details and you should be OK. So, I did a little non-scientific study and found that about 90% of the crocheters I talked to are introverts. Now, that doesn’t mean we CAN’T be around people, but we usually don’t go out of our way to connect…not even online. The downside to that, though, is that we often neglect to ask for help and, when it comes to pattern writing, it doesn’t pay to go it alone. I know some people who are adamant that they can edit their own patterns and know that everything will be fine, but I’m not one of those people and recommend that you not be one of those people, too. There are, at least, two people you’ll need to connect with before publishing your pattern. The first is a pattern tester…and more than one is even better. What I’d prefer you do is find two testers for each size of the pattern you’ll be writing. That way, you get a variety of types of crocheters, a variety of stitch tension, and a variety of expertise. If you don’t have any friends who can pattern test for you, join us in the Made with a Twist Facebook group and ask around, I’m sure there will some folks who would be happy to help. Secondly, I recommend that you find yourself a tech editor to take a deep dive into the tiniest of details of your pattern. Typically, tech editors will charge a fee for her service. So, I understand if that’s not in the budget just yet, but keep this on your radar and read more about my thoughts on this in my post: The Biggest Mistake I Ever Made as a Crochet Designer. Again, this heading, Failing to Launch, applies in two realms. First, it applies to that designer who just fails to ever put pencil to paper and start designing…don’t let that be you. Secondly, it applies to the designer who, after writing her pattern, never tells anyone about it. She simply uploads it to Ravelry or to Etsy and just waits for it to be found. Again, don’t let this be you! There are myriad ways to market your design after it’s published, from Facebook groups to advertising and blog posts to InstaStories – after the pattern is written, the job is only half done. Then, the marketing begins. If you need some help launching your pattern, I have a free resource called The Best Pattern Launch Plan Ever that my newsletter subscribers can download at their convenience from my Free Crochet Business Resource Library. You can click here to request access. So, those are them, the most common mistakes I see crochet designers make when writing patterns. I hope you found the list helpful and I hope you’ve found the courage and encouragement you need to sit down and get your pattern written. If you’re still on the fence, though, won’t download the “Crochet Designer Sketch-Notes” and use them as a guide to capture all the details?